Sports Authority is celebrating reopenings at 18 locations in the Bay Area, including the East Palo Alto store at 1775 E. Bayshore Rd. There will also be hourly $100 gift card drawings from 9 a.m. to 6 p.m. and a chance for customers to win a $500 Sports Authority shopping spree. Sports Authority stores are now equipped with an improved store design and specialty sport shops with products from top brands like Nike, Under Armour, Adidas, The North Face, etc. 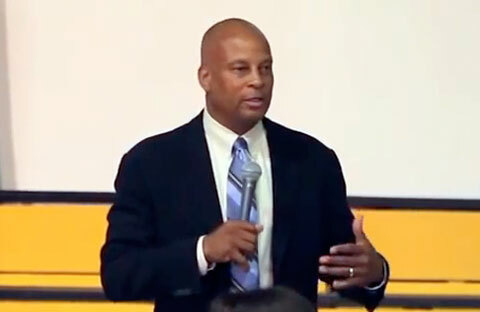 Former defensive back, Ronnie Lott, played for the San Francisco 49ers, Los Angeles Raiders, New York Jets and Kansas City Chiefs for fifteen seasons during the 1980s and 1990s. He was elected into the Pro Football Hall of Fame in 2000, and is widely considered one of the best defensive backs in NFL history. After his retirement, Lott served as an analyst on Fox NFL Sunday in 1996 and 1997, and working on the network’s game coverage in 1998. He is currently on a show called PAC-12 Playbook on the PAC-12 television network. Lott is also a popular motivational speaker. To book Ronnie Lott for a speaking event or appearance, contact Ronnie Lott’s booking agent at PFP Talent Agency. Call 800.966.1380.